The Engineering Peer Tutoring Service is sponsored by the Faculty of Engineering, and is designed to help Year 0 and Year 1 students. 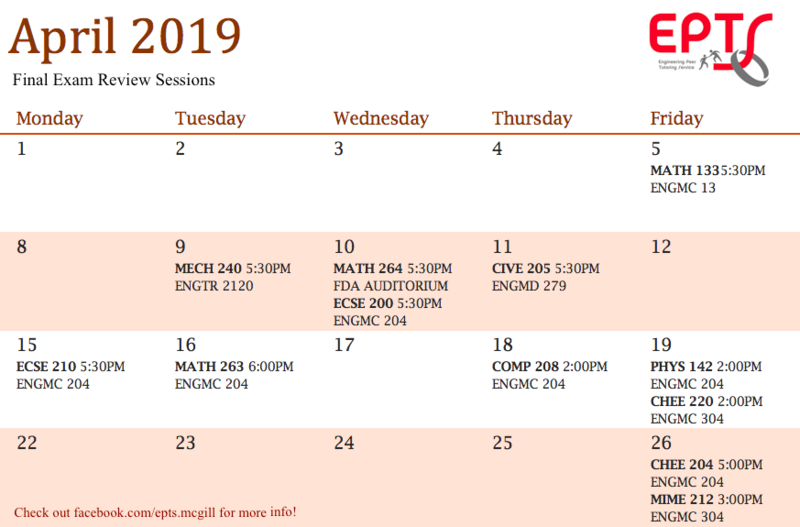 Tutorial sessions are conducted daily in the McGill Engineering Student Centre (MESC) on the ground floor of the Frank Dawson Adams Building, Room 6B. The tutorial program has been available to engineering students for more than 40 years to ease students' transition from high school and CEGEP to university, since the first year at university requires adjustments to students' study practices as they develop new study skills. Engineering Faculty courses are conducted by Professors and Teaching Assistants (TA), which include tutorials, however some students need additional personal attention. This is where the Peer Tutoring Service can play a key role in assuring success at McGill. The tutors can answer some of the most challenging questions and help give students what they need to obtain results in their respective field of study. This program also offers direct contact with an upper-year student who has already been through the program! Peer Tutors are available daily from the third week of each term. Additionally, seminars are held each term prior to midterm exams for an opportunity to review material. The availability of tutors, their skills and knowledge make the Peer Tutoring Service an essential part of student life. Hi, my name is Feras and I am the U0 Physics tutor. I am currently in U3 Electrical Engineering with a Software Engineering minor. Your first physic courses can sometimes feel pretty confusing but with the right advice and mentorship, it can all make sense! I have tutored math and physics at the freshman level for a few years now and I even have some TA experience (from MATH 263). As such, if you ever feel like you are struggling with physics, feel free to pass by and I could help you out! My name is Salar and I’m a U2 civil engineering student with a minor in computer science. Don’t ask me how those two programs are related, I wouldn’t be able to tell you. I just enjoy them both. I’m also a huge sports fan and currently have 3 (dreadful) fantasy teams in football, basketball and hockey. As this semester’s CIVE tutor, I’ll have the pleasure of going over some of the foundation (see what I did there?) courses in the civil engineering curriculum, so whether it’s a question on Mohr’s circle, general tips on how to study for the different courses or just what to expect from exams, come see me during my hours and I’ll be sure to clear some things up! My name is Hansen, and I’ll be your tutor for all the first year MECH courses! Don’t let the fact that they’re 200 level courses deceive you; Statics, Dynamics and Thermodynamics are some of the hardest courses in our curriculum. I always enjoy helping out other students, so come ask me about anything, be it the heat transfer between a cold beer and your stomach, to the gyroscopic dynamics of a satellite! My name is Dylan and I am one of the U0 math tutors this year. I am a third-year, U2 Software Engineering Student from our nation’s capital, Ottawa. U0 math courses may seem the same as high school, (or not!) but I promise, the exams can be very tricky! Come by EPTS and we can go through any and all questions you have about Webwork, tutorials, and exam questions! Hey! I’m Deifilia, and I’m in U2 Chemical Engineering with a minor in CS. In my ideal life, I’d be a engineer-athlete-published writer. Since life isn’t ideal, I make up for it by playing Ultimate Frisbee, hiking up mountains, and writing little articles for myself. My goal for the year is to debunk the myth that U1 CHEE courses are impossible to succeed in. The hardest part is figuring out how to study and what you need to know. Drop by my office hours with your study/assignment/midterm questions, and I’ll give you a hand. I’m looking forward to meeting you! My name is Itai and I am one of the U1 math tutors. I am a U3 bioengineering student, and this is my 4th year at McGill. I have always enjoyed learning with others, and I hope that together, I can help you understand the complex and interesting concepts of advanced calculus! If you ever need help with your Webwork, or with concepts covered in class, please feel free to drop by the EPTS room, and I’d be happy to help you out! I look forward to meeting you all! Hi! I’m studying Mechanical Engineering with a minor in Computer Science, and this year I’m the COMP tutor for EPTS. I’ve been tutoring people since high school and I love doing it. I love learning new languages in my free time and exploring cool things I can do with coding. EPTS helped me a lot in my first two years at McGill and I’m here to return the favor. I think my favorite part of being a tutor is seeing the ‘ah-hah’ moment when I help a student understand a topic they were struggling with for a while. If you’re ever having problems understand a tricky algorithm your professor showed in class, or just wanna chat about CS things, feel free to drop by my office hours. Cheers! My name is Sinan and I am very excited to be your MIME tutor for this year! I am a fourth year Materials Engineering student, minoring in nanotechnology and I am here to help you with all your MIME questions. I know how difficult the first year of engineering classes can be, with all the different professors (three for one class), different materials, and different expectations, and it is very easy to get overwhelmed. I am here to help put the puzzle pieces of Materials Engineering together and show you how learning about mineral processing can even come in handy for your advanced materials class. If you ever have any questions about course material, internships, or just want to chat, drop by anytime! Hello! My name is Greg, and I am the ECSE tutor for this academic year. I am a fourth year electrical engineering student, and this is my second year at EPTS. I know that some of the 200 level ECSE courses have the steepest learning curve at McGill. I’m here to help you through it! Salutations fellow students, Please allow me to introduce myself: my name is Denis and I'm the MATH271 (Partial Differential Equations) tutor. I have many hobbies such as playing guitar, cycling, reading books, enjoying the occasional video game... But I also really love maths. Mathematics is an intricate field that has many applications in engineering. This is exactly what MATH271 is about: creating mathematical models of real engineering systems. That is also why it's one of the most important maths courses you will take in your curriculum! For me, teaching is a passion, a job, a challenge and a hobby. I am here to help you guys get good grades but also, hopefully, to make you appreciate how maths and engineering intertwine in real life! If you need help in this course, I am here to answer all your questions. I look forward to meeting with you all! Hey everyone! My name is Judy, and I'm one of your U1 Math tutors - that means I'm here to help you with anything you need for 262, 263, or 264. I'm actually also a TA for 264 this year, so some of you Calc 4 folks might recognize me from my tutorials. When I'm not doing math (an increasingly rare occasion, to be honest), you can probably find me drawing, painting, or sipping some beers at Blues Pub. I'm also a U2 Mech student, and I know just how stressful McGill can be - but with the right approach, math really doesn't have to be one of the reasons why. Drop by my hours, and I promise I'll help you out as best as I can!